Running onto my front yard in my robe and yelling at my older kids as they were running to catch the bus. And have I mentioned that we live on a very busy street? A very proud moment. Then running back into my house to watch the little ones, my 5-year-old, JT, has the camera to capture it all. Seriously? I will spare you the close up of my face on this one. It isn't pretty. Later in the day I felt like Steve Guttenberg. That is a sentence I promise you I never imagined typing. Ever. Not my normal week. Many of you may not remember Guttenberg, but he was a kind of big star in the 80s. One of his big movies was "Cocoon." Remember that movie? Remember all the old people? Well, Guttenberg was one of the only young guys in the whole movie. While at a new doctor's office to get a pneumonia re-check/x-ray today I found myself smack dab in the middle of a "Cocoon" recreation. Old people in the waiting room. Old people in the elevator. Old people coming in and out of the patient rooms. Everywhere I looked, old people. Of course I had a child with me, never really without one, ever. Most of the old people loved my baby Wade who was quietly taking in the scene from his stroller. "They call these olden years the golden years, guess that's true, for the doctors," chuckled the old man sitting next to me. He looked like Ted from the Mary Tyler Moore Show, except older. Some moved slowly with walkers and smiles. Many old couples were there and the wife would wait for her husband while he went in for xrays or tests. Some were there with caregivers. Some of them talked about their grandchildren and great-grandchildren. Others talked about the weather. "Oh, I remember those days," said one old lady as she watched me try to navigate the stroller through the waiting room. "Best time of my life, the good old days." Okay, I get it. The old people and the universe are telling me to enjoy my good old days. Instead of worrying about every detail and every money problem. Instead of stressing every time my kid doesn't seem happy. Instead of fretting endlessly over every decision. I need to get more in the moment. The good moment. So now, as I prep for another busy weekend of an over-scheduled life with kids that mean more than the entire world to me, I am thinking about all of this. I vow to worry less and laugh more; snap less and hug more; yell less and listen more; and simply be in the moment. And more importantly, enjoy the moment. Because these are the good old days. And the funny days. I have to believe one of my children will grow up and have a sense of humor about their crazy mother running down the street in her robe to yell at them to "have a good day honey." Or it might be a good story for their therapist. 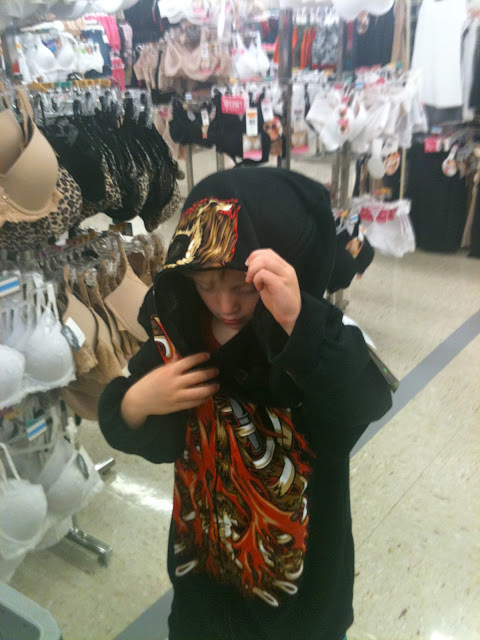 This picture taken at Kmart in front of the giant bras might be used in therapy someday. So, bring it fall, I am ready! I am so going to be in the moment and love it, or at least laugh at it. ***This is not a craft blog and I never claimed to be crafty. What? You thought I was going to have a "Cocoon" clip? C'mon? That movie is way too old.